Lemon-Herb Goat Cheese in Endive Spears - A recipe from Savor California, the online showcase for extraordinary gourmet foods and beverages from California. Take cheese out of the refrigerator and allow to soften. Using on/off turns, blend goat cheese, olive oil, lemon juice, and lemon peel in food processor just until smooth and creamy. Transfer mixture to medium bowl. Stir in chopped cilantro and chives. Season cheese mixture to taste with salt and pepper. Cut off and discard root ends of endive. Separate leaves. Save small inner leaves for another use. 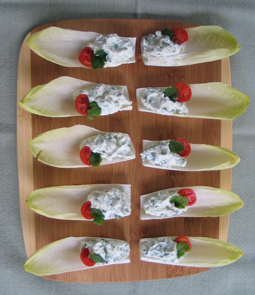 Arrange endive on serving platter. Pipe or spoon about 1 1/2 teaspoons cheese mixture at wide end of each endive leaf. Place 1 very small cilantro leaf and a tomato slice atop each.